I don’t know about you, but when I was seven, I spent most of my time pretending to be a dog. My barking was my parents’ faithful alarm clock most mornings. It was great. 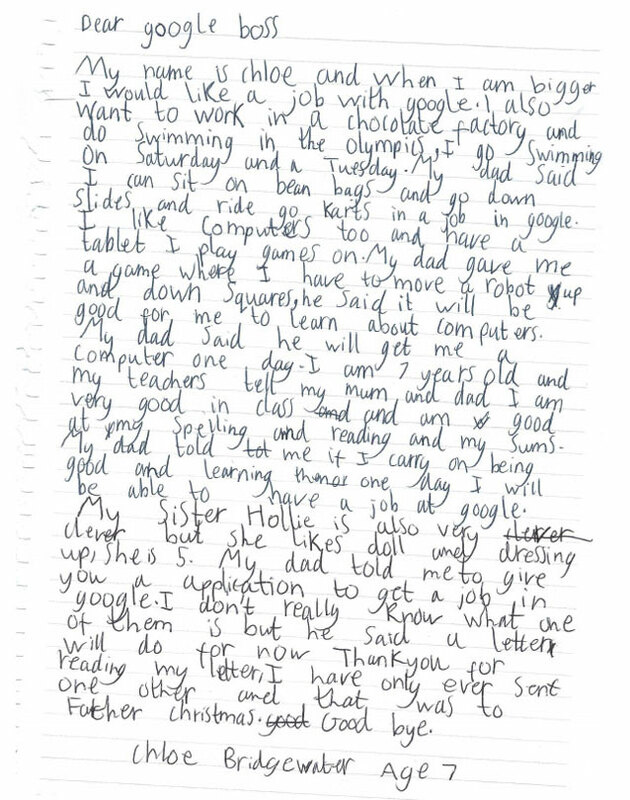 Like any good candidate, Chloe touts her strengths, writing “My teachers tell my mum and dad I am very good in class and am good at my spelling and reading and my sums." 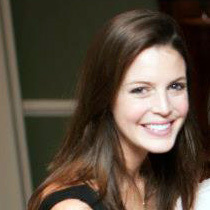 She also highlights her unique skillset, writing "My dad gave me a game where I have to move a robot up and down squares, he said it will be good for me to learn about computers." And, instead of hearing no response to her application or the dreaded generic rejection letter, just a few days later she received a letter directly from “google boss” himself: CEO Sundar Pichai. While he doesn’t give her a job, Sundar encourages Chloe to apply again when she is done with school and urges her to keep learning about computers, robots and technology. “You can accomplish everything you set your mind to,” he writes. 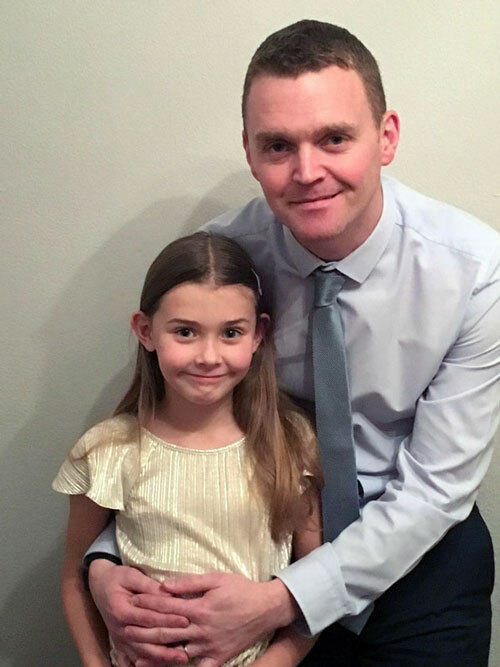 Chloe’s interest in Google came after a conversation with her Dad, Andy Bridgewater, who had told her he’d want to work at Google after she asked him where he would want to work if he didn’t have his current job. “After seeing images of Google offices with their bean bags, go karts and slides” she knew she wanted a job there, Andy wrote in a post on LinkedIn. 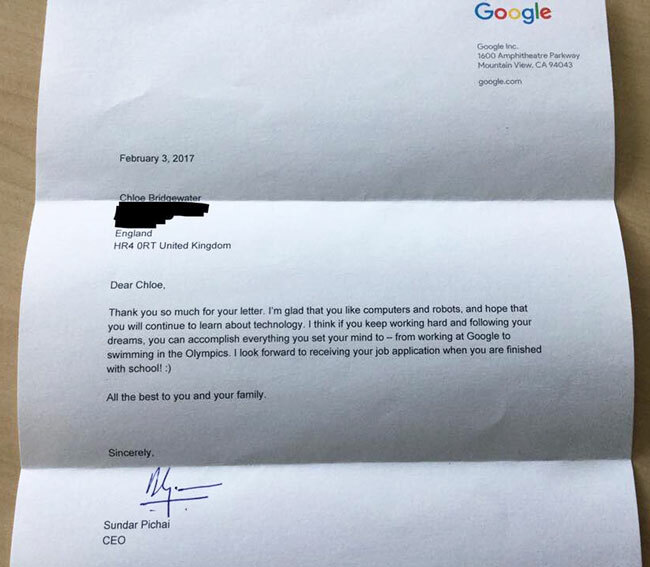 And, thanks to the letter from Sundar, “she is now even more eager to do well at school and work for Google,” he says. While this isn’t a typical situation, it shows the impact that rejecting candidates the right way can have – especially for those who don’t yet have the experience you are looking for. Not only did Sundars’ letter encourage Chloe to keep growing her skillset and apply again, it also made her even MORE passionate about working at the company in the future. Talk about a candidate pipeline. Yes, sending rejection letters to every candidate is time consuming. But studies show that 40% of candidates who don’t hear back from an employer say they’ll never apply to the company again. And there’s a monetary impact as well - if you don't take the time to let them know they didn’t move forward in the process, what are they going to say to others about your business? It’s bad for your employer brand and bottom line. All in all, how companies deal with rejection says a lot about their character. And the truth is, if a CEO can make time to kindly reject a hopeful seven-year-old, we can all make time to handle candidate rejection the right way.